Since the directions didn’t forbid it, I worked maze games from the end backwards to the beginning. You should try it. You’ll be done a lot quicker. Whenever I pack a bag for a trip, I picture myself fully dressed and take inventory of what I need: shirt, pants, socks, underwear, etc. I take a mental inventory of everything I need to get ready before getting dressed (not a great visual): deodorant, cologne, shaver, toothbrush, toothpaste, etc. So it should come as no surprise that I build my to-do lists and marketing plans the same way. Let’s walk through how you can build a simple catering marketing plan. First, what are your main goals? I'm guessing to increase catering sales and build repeat business. I like to create a simple bulleted checklist. Start with each month of the year as a heading. Then put your strategies and tactics for each month as a subheading in your marketing plan outline. The first place to start is with the “definitely” list. What do you know you will be doing in the next twelve months to promote catering? Marketing materials at your restaurant: table tents, signs, flyers, menus, etc. Let's explore some of these strategies a bit more closely. Email marketing should be one of the first strategies to hit your list. Under each month of the year, you will have a bullet called “Monthly Email”. If you know your theme, go ahead and add it. Our catering software comes with an email marketing feature with prewritten email templates. This will save you time coming up with ideas and writing your emails. Are there any other ongoing marketing programs? One of the most overlooked and valuable is a catering customer reactivation campaign. Though you can mail letters to inactive catering clients, I prefer to pull up a list of all clients who haven’t ordered catering in the last 60 days and call the ones who you think should have ordered. Are you running or planning on running a catering loyalty program? What about sending thank you letters? This is a very low-cost way to bond with your catering clients. One of my favorite ongoing marketing programs is a catering client birthday program. Send all of your best catering clients a card or letter wishing them a happy birthday along with a gift certificate to your restaurant. All of the above can be put on auto-pilot in our catering software. Of course, thanks to spreadsheets, you can also manage them yourself, instead. 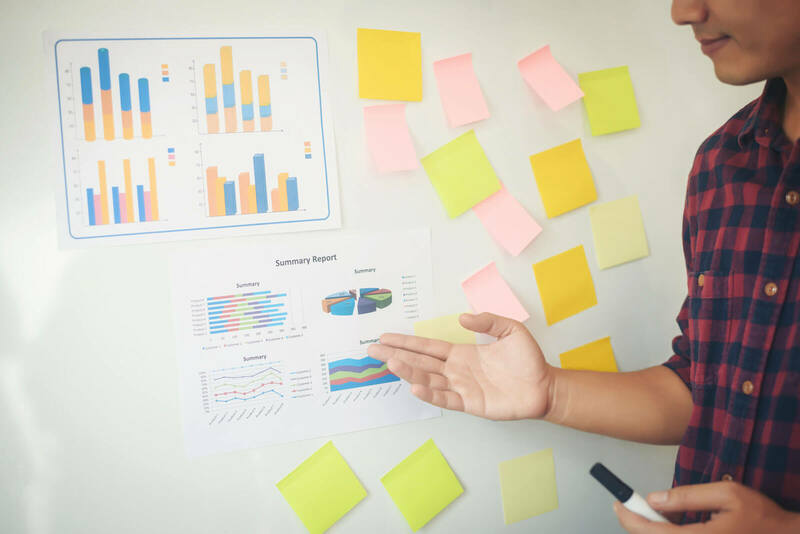 Once you have completed all of your niched catering initiatives, start to brainstorm other marketing strategies you’d like to test. It may be to proactively go after new corporate catering clients. Whether via a system you design, or using our catering Sales Tempo, this is a worthwhile tactic to pursue throughout the year. Once you have your master marketing plan, you’ll want to go back and pick dates for each project. If you are a major planner, you can then take each tactic and create a bulleted list underneath, listing out each step/component and the due dates. For me, I find myself taking my marketing plan and listing out my current projects in my Moleskine notebook. My girlfriend gave me the notebook along with a Moleskine rollerball pen. I can’t work without it. There is something comforting about using a pen and paper. As you may know, I'm always on the lookout for great ideas to make our catering software and marketing systems better for our clients. One of my more successful clients, Mark Rogers, had asked me about creating a marketing reminder system. At first I dismissed it, but then the lightbulb went off. What if we could provide a preloaded catering marketing calendar for our clients with reminders that show up in our software and in our clients’ inboxes? Well, it's available as a feature in our CaterZen marketing software! 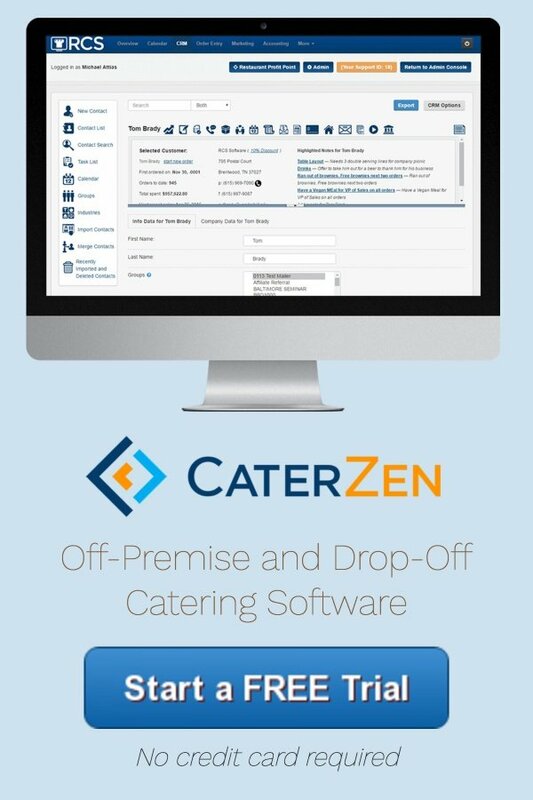 CaterZen customers have a database of preloaded catering marketing ideas delivered throughout the year. They have the option of turning off the notification for a strategy or modifying the reminder date. Our customers can also add their own catering marketing tactics to the reminder system and set their own reminders for them. Unless you're disciplined enough to create a catering marketing plan and implement a system to keep up with it, a system like ours will make your life easier. You won’t have to remember at the beginning of each month to call inactive catering clients. This system will prompt you to do it…and much more. To “plus” the system, for each promotion we will be including links to sales letter templates found on our members-only website, RestaurantProfitPoint.com. Need Help With Catering Marketing Strategies? Jillian, our Marketing Director, is taking each marketing strategy and creating an entire playbook for each one. Our clients will get an A, B, C, 1, 2, 3 plan to follow from how to find/build a targeted list to when/how to send out the sales letter to how best and when to follow up. Whether you choose to work with us or go it yourself, now is a great time to be working on your catering marketing plan for the second half of 2018. Plan now to make this year a record year for your catering sales! 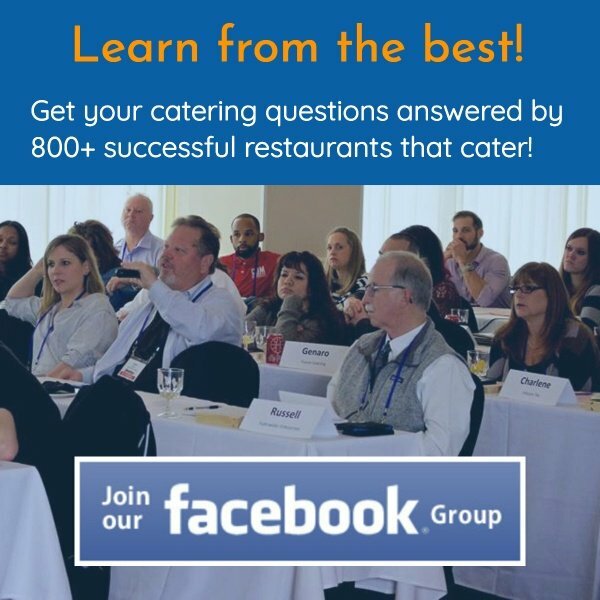 Looking to Learn How to Market a Catering Business? Let me encourage you to a join our 800+ member Facebook group I created for our industry: Restaurants That Cater. What kind of marketing are you doing for your catering business? Let us know!